You may consider it your enemy, it has definitely been responsible for more than a few oddly shaped pistons and blown head gaskets. The fact of the matter is that heat is simply energy, it works both for us and against us. A tremendous amount of heat is generated from the combustion process and put to work, the more we can harness the more efficient our engine becomes. Approximately 1/3 of that heat is wasted through exhaust gas ( which can be utilized by turbochargers, but that is another story ) approximately another 1/3 is actually used to drive the piston downward and get the job done. The remainder of this heat energy is radiated outward from the cylinder and your cooling system is designed to transfer that heat to your coolant and pass it through a heat exchanger to keep engine temperatures in check. 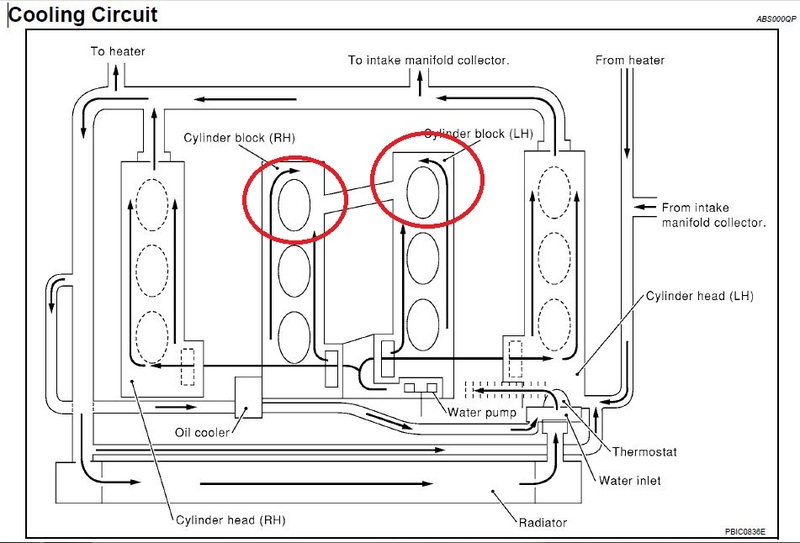 This is the cooling circuit diagram for the VQ35 straight from the 03 350Z factory service manual. One look at this diagram will tell you that this aint your granpappy’s ol’ small block. Shortly after the 350z was released, aftermarket performance parts came pouring out of the woodwork to support enthusiasts. Before you knew it there were big time turbo kits and high powered engine builds to the tune of 600whp. It was then that these tuners began to see the apparent downfall of the cooling system for the VQ35 used in the Z33. In this diagram you will see the rear cylinders ( #5 and #6 ) circled in red. If you follow the flow chart from the water pump you will see that coolant flows into the engine from that point, up through the heads and into the engine block. Coolant flows from the front of the head to the rear and exits through the water pipe connected to both sides. The block on the other hand is another story, the coolant flows from the front of the engine to the rear cylinders and has nowhere else to go. I’m not about to call out Nissan engineers (although I’ve had cause to curse them in the past) because under normal and even spirited driving conditions the factory cooling system will keep engine temps manageable. However, under heavy load conditions such as a long highway pull on a high powered engine or pulling lots of weight uphill, coolant flow to the rear cylinders is insufficient and can lead to troublesome or even catastrophic engine failure in the form of blown head gaskets or over expanded pistons that will have a once smooth cylinder looking more like a funnel. Enter the Pathfinder. 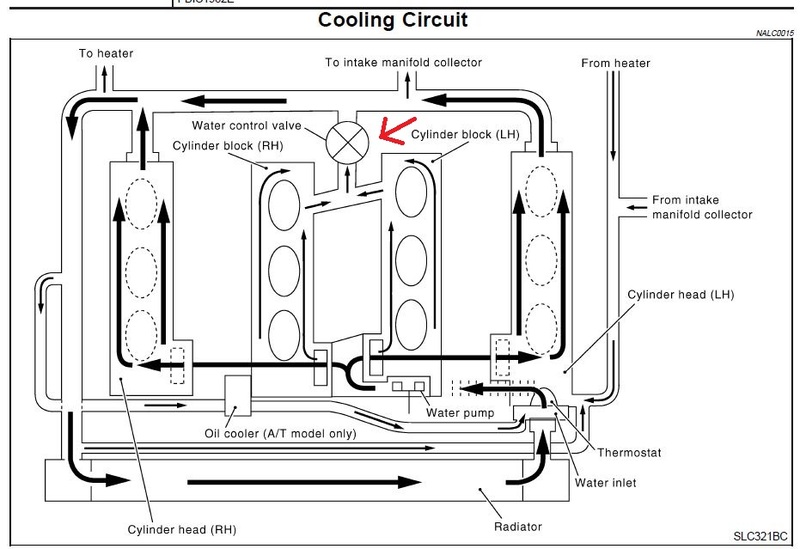 The VQ35 found in the Pathfinder is only slightly different than the Z33 VQ35, but the one major difference worthy of discussion in this particular post is pointed out in red on this cooling circuit diagram. If you follow the same flow, from the water pump and into the engine block, you’ll find that the coolant now has a “back door” out of the block where it will meet the other superheated coolant from the heads and return to the radiator. A thermostat is in place between the block and water pipe (shown on the diagram as an X) simply to let the engine reach operating temperature more quickly and reduce emissions. Nissan engineers saw this one coming during their road tests for the Pathfinder, though they didn’t tune those VQ35′s to unscrupulous amounts of power, they more likely just ran them really hard off road and hauled lots of weight uphill. There’s no telling how many engines they scrapped before they decided on this system, but their loss is our gain. Many fine retailers have put together “Pathfinder cooling mod” kits that will supply you with the rear coolant pipe, thermostat, hose and plate that you can swap right into your Z33 to greatly improve your coolant flow and safeguard your rear cylinders. Is it something that your momma needs on her sedan to run to the grocery store? No, but you should give the Pathfinder system as well as other “reliability mods” some consideration if you plan to really put your VQ35 through a beating with lots of boost or serious track time.